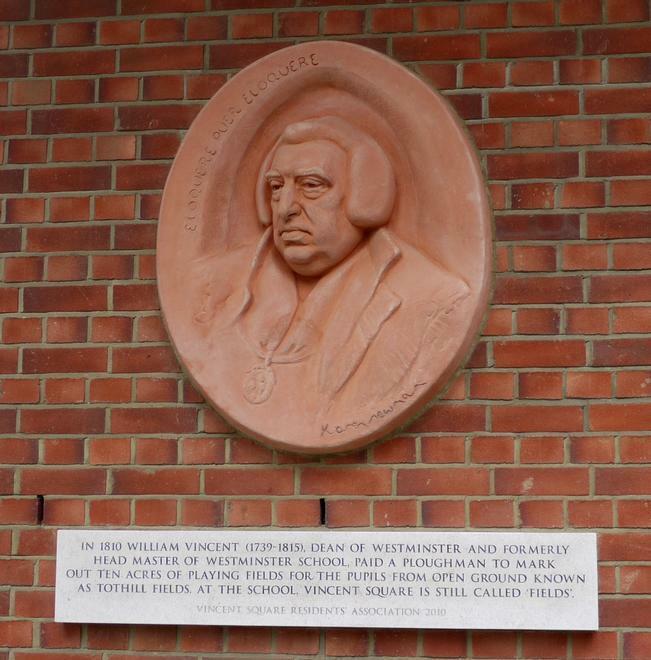 In 1810 William Vincent (1739 - 1815), Dean of Westminster and formerly headmaster of Westminster School, paid a ploughman to mark out ten acres of playing fields for the pupils from open ground known as Tothill Fields. At the school, Vincent Square is still called 'Fields'. Vincent Square Residents Association 2010. 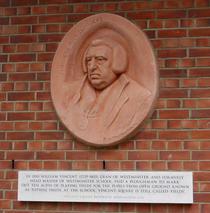 The terracotta plaque and Nabresina stone tablet, were commissioned by the residents' association to commemorate the bicentenary of the allocating of the grounds as school playing fields. The sculpture is based on a painting by William Owen, court painter to the Prince Regent. 'Eloquere puer eloquere' translates as 'Speak out boy, speak out', Vincent's familiar cry when headmaster of Westminster School. Ornamental Passions provides some more information. Sculptor. Born London in about 1953.